Martin Luther found peace when he married an ex-nun named Katharine von Bora, whom he had helped to escape from her nunnery in an empty fish barrel and had taken refuge in Wittenberg. Katharine von Bora was born in 1499, the daughter of an impoverished nobleman. In 1504 she went to the convent school of the Benedictine order in Brehna (near Halle) and entered the convent of Nimbschen, near Grimma in 1508. In 1515 she took her vows and became a nun at the soonest possible date. In 1523 she left the convent and ended up in Wittenberg. By June 1525, echoing a trend across Europe as former nuns and monks married, she became Mrs Martin Luther. Katharine was 16 years younger than Martin and together they had six children. Luther doted on his large family but was able to devote himself to the simpler pleasures of life, gardening, writing music. Katharine took over the household, particularly the household expenses; it is said that Dr Luther did not have a clue how to run a household. She also proved herself to be a good housewife and gardener. Luther's household included not only his wife and six children, but also one of Katharine's relatives and after 1529 six of Luther's sister's children. Luther also housed students in his home to help the family's financial situation. For recreation the Luthers enjoyed a bowling lane of sorts in their garden, board games such as chess, and music. They had a pet dog. They grew much of their own food in a small garden at the Black Cloister and then later as a farm outside Wittenberg. Luther and Katherine were diligent parents, disciplining their children, but doing so in love. Their home was noted for its liveliness and its happiness. Katherine outlived her husband by six years. 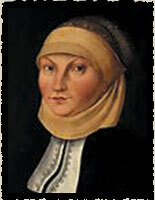 She died on December 20, 1552 in Torgau where she had fled from the plague in Wittenberg.